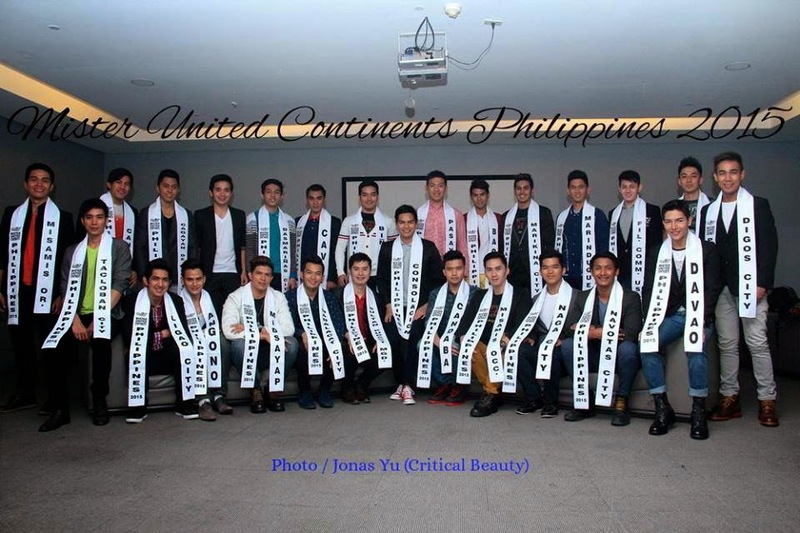 The first-ever Mister United Continents Philippines 2015 has announced its thirty-seven (37) official candidates representing the various regions all over the country - from Metro Manila, Luzon, Visayas and Mindanao. Finals Night will be held on April 14, 2015 at Tanghalang Pasigueño in Pasig City. 28 years old | Height:5'10"
24 years old | Height: 5'9"
20 years old | Height: 5'10"
25 years old | Height: 5' 9 1/2"
23 years old | Height: 5'9"
27 years old | Height: 5'9"
24 years old | Height: 5'10"
21 years old | Height: 5'9"
25 years old | Height: 5'9"
19 years old | Height: 5'9"
21 years old | Height: 6'3"
22 years old | Height: 5'9"
26 years old | Height: 5'11"
23 years old | Height: 5'10"
26 years old | Height: 5'9"
24 years old | Height: 5'11"
19 years old | Height: 5' 10"
26 years old | Height: 5'10"
27 years old | Height: 5'10"
21 years old | Height: 5'11"
24 years old | Height: 6'2"
19 years old | Height: 5'11"
22 years old | Height: 5'11"
26 years old | Height: 5' 10 1/2"